A hiatus hernia is when the top part of your stomach slides upwards into your chest. It’s a very common condition, affecting nearly a third of people over 50. You don’t necessarily need any treatment for a hiatus hernia if it isn’t causing you any problems. If you do have symptoms, the main one is heartburn. Most people can ease the symptoms of a hiatus hernia by making lifestyle changes and, if this isn’t enough, by taking medicines. Some people need surgery to repair a hiatus hernia. A sliding hiatus hernia is when the junction between the oesophagus and the stomach, as well as a portion of the stomach itself, slides up above the diaphragm. To understand how a hiatus hernia happens, it helps to know more about the structures inside your body. And you may find it helpful to watch the video above. You have a sheet of muscle, called your diaphragm, which separates your chest from your abdomen (tummy). Usually, your stomach sits completely below your diaphragm. When you swallow your food, it passes down a tube called your oesophagus to your stomach. Your oesophagus passes through an opening (hiatus) in your diaphragm. A hiatus hernia usually develops when part of your stomach slides back up through this opening and into your chest. This doesn’t necessarily cause you any problems. But having a hernia may allow fluids from your stomach to travel the wrong way, back up your oesophagus. 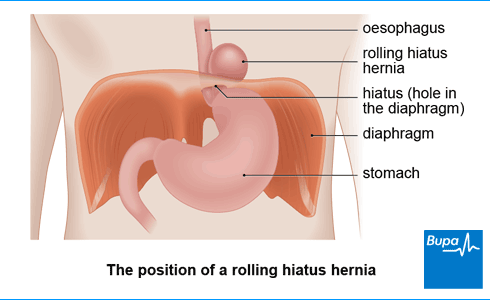 This is what causes any symptoms you have (for more information, see our section: Symptoms of hiatus hernia below). Hiatus hernias are very common. You can have the condition without knowing because it often doesn’t cause any problems. Making changes to your lifestyle and taking medicines can’t cure a hiatus hernia, but can help to ease or prevent any symptoms you may have. There are two main types of hiatus hernia, which we describe here. Sliding hiatus hernia (by far the most common type). This is when the join between your oesophagus and your stomach (the gastro-oesophageal junction) slides up into your chest, followed by the top part of your stomach. 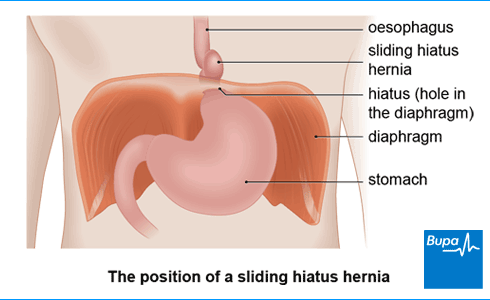 Eight out of 10 people with a hiatus hernia have a sliding hiatus hernia. Rolling hiatus hernia (also called a para-oesophageal hiatus hernia). In this type, a part of your stomach passes up into your chest to lie alongside your oesophagus. Your gastro-oesophageal junction stays where it should be, below your diaphragm. You can also have a mixed hiatus hernia, which is a combination of these types. Many people have a hiatus hernia without having any symptoms. However, a sliding hiatus hernia can cause a problem called gastro-oesophageal reflux disease (GORD). This is when acid in your stomach rises back up into your oesophagus. Sometimes it’s called by a shorter name – acid reflux. You can have GORD without having a hiatus hernia, and you can have a hiatus hernia without having GORD. If you have symptoms like this, you may find it helpful to read our information on indigestion. Your GP may be able to recommend treatments to help your symptoms of heartburn without the need for tests. If these treatments don’t work or your GP has concerns about your symptoms, they may refer you to a gastroenterologist for tests. A gastroenterologist is a doctor who specialises in conditions of the digestive system. Your gastroenterologist may suggest you have an endoscopy (also called a gastroscopy). This is done using a tube with a camera on the end, called an endoscope. The endoscope is passed through your mouth and down into your stomach. Your doctor can see images of the inside of your oesophagus and stomach on a screen. They can also take a biopsy (a tissue sample) at the same time. You can find out more from our information on gastroscopy. Another test your specialist may advise you to have is a barium meal test. In this test, you swallow a substance that helps to show up your digestive system on an X-ray. To find out more about this test see our information on barium swallow and meal. A hiatus hernia is sometimes discovered by chance when you have a test for something else. This is because a hiatus hernia doesn't always cause symptoms. There’s a lot you can do yourself to ease the symptoms of a hiatus hernia, and to help stop them from happening again. Try to lose any excess weight you have. Avoid large meals. Instead of eating three big meals, aim for several smaller ones throughout the day. Don’t eat anything for several hours before bedtime. Raise the head of your bed if heartburn bothers you at night. Try to avoid things that raise the pressure inside your abdomen. This might include wearing tight clothing around your middle, such as tight belts, and weight training. If you notice that some foods and drinks make your heartburn worse, try cutting them out. Some of these might include coffee, alcohol, chocolate and fatty foods. For more information on this, see our FAQ: Which foods should I avoid with a hiatus hernia’ below. Treatment for hiatus hernia depends on how severe your symptoms are and how much they’re bothering you. You don’t usually need treatment for a hiatus hernia if it’s not causing you any problems. There are lots of indigestion medicines that can ease the symptoms of heartburn when they happen. You can buy many of these without a prescription – ask your pharmacist for advice. Your doctor may also advise which treatment is likely to be best for you, depending on your symptoms. They’ll explain whether the treatment they recommend should only be taken when you have symptoms or all the time. Medicines which may be used to treat the symptoms of a hiatus hernia include the following. Antacids – these work by neutralising the acid produced in your stomach. Alginates – these form a raft that floats on top of your food and stomach acid, making a barrier. Proton pump inhibitors (PPIs) – these work by reducing the amount of acid your stomach produces. H2 receptor antagonists – these also reduce the amount of acid produced by your stomach. You can find out more about these treatments from our information on indigestion medicines. If other treatments haven’t worked and your symptoms are severe, your doctor may suggest an operation. The most common surgical treatment for a hiatus hernia is an operation called a fundoplication. This is often done as a keyhole (laparoscopic) procedure. You can find out about this operation, and what it involves from our information on fundoplication. A rolling hiatus hernia can sometimes get trapped or pinched by the diaphragm, cutting off the blood supply. This is called a strangulated hernia and causes severe pain. If this happens, you’ll need an operation immediately. Doctors aren’t sure why some people get a hiatus hernia. However, people who are obese (very overweight) are more likely to develop one. And you’re more likely to develop a hiatus hernia as you get older. This might be because some of the tissues in your diaphragm get weaker. Hiatus hernia can also happen during pregnancy. Most people with a hiatus hernia have no problems at all. Some have symptoms which are kept under control by lifestyle changes and medicines. Occasionally, a hiatus hernia can lead to more serious problems. If your hiatus hernia keeps letting stomach acid come up into your oesophagus, you may get one of the following complications. Inflammation of your oesophagus (oesophagitis). Your oesophagus can become damaged by the acid from your stomach, and this can lead to ulcers which may bleed. Anaemia caused by bleeding from an ulcer. Narrowed oesophagus (a stricture) – this is caused by scarring from repeated inflammation. This can cause food to get stuck or to come back up. Barrett’s oesophagus. This is where the cells that line your oesophagus change and become abnormal. Eventually, these cells may become cancerous. If you have Barrett’s oesophagus, your doctor will monitor cells in your oesophagus to spot and then treat any changes quickly. You can find out more from our information on Barrett’s oesophagus. If you have a rolling hernia, the part of your stomach which has gone up into your chest can become trapped there. You would then need surgery immediately. For more information, see our section: Surgery above (in Treatment of hiatus hernia). Are obesity and heartburn related to hiatus hernia? Are obesity and heartburn related to hiatus hernia? People who are overweight are more likely to get heartburn and indigestion. They’re also more likely to develop a hiatus hernia. Doctors don’t know for sure why this link exists, but being overweight can increase the pressure inside your abdomen (tummy). This forces acid from your stomach up into your oesophagus, causing heartburn. If you can lose some weight, this may help to stop your heartburn symptoms as well as improving your health generally. There are lots of other things you can do to ease symptoms from a hiatus hernia – see our section: Self-help for hiatus hernia symptoms above. You can also ask your pharmacist about over-the-counter treatments for heartburn. If you still have symptoms or they are severe, contact your GP. Which foods should I avoid with a hiatus hernia? Which foods should I avoid with a hiatus hernia? Many people who have a hiatus hernia have no symptoms. However, if you have symptoms such as heartburn, you may find that avoiding certain foods helps prevent these. You may already be aware that some of these or other foods trigger your symptoms. If you’re not sure, try printing and filling out the food and symptoms diary below (PDF 1MB). This may help you to identify foods that cause you problems. Try eating small meals only and avoid eating for a few hours before sleeping. And remember that even if you cut out some foods, it’s important to keep eating a healthy balanced diet. Barrett's oesophagus is when the cells that line the lower part of your oesophagus get damaged by acid and bile travelling upwards from your stomach.